There's no hardware as cool as space hardware. And there's nothing cooler than watching astronauts and scientists testing out equipment to take us off-world — even equipment that was never used. Here are our favorite images of NASA testing its equipment on Earth. 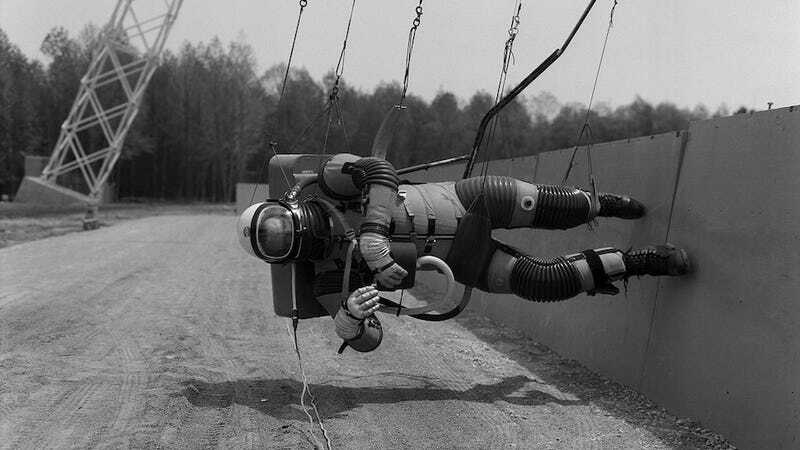 Top image: Reduced Gravity Walking Simulator, located at the Lunar Landing Facility at NASA's Langley Research Center in Virginia, 1965, via Wired. NASA's Mars rover, FIDO — Field Integrated Design and Operations, is tested Thursday, April 29, 1999, in the Mojave Desert near Baker, California. FIDO was designed to help scientists figure out how to use the kinds of instruments the next Mars rovers will need to fetch the most scientifically interesting rocks. A University of North Dakota Space Studies graduate student named Fabio Sau tests out a experimental planetary space suit in the North Dakota Badlands near Fryburg, N.D., on Saturday, May 6, 2006. A team of an astronaut and a geologist drive a Small Pressurized Rover through the Arizona desert during field tests of the latest moon buggy. It's not the final rover design, only the leading prototype at the moment when the photo was taken in 2009. Researchers test spacesuits on a simulated Mars surface during a training session at Moscow's Institute for Medical and Biological Problems in May 2010. Bonus: The USAF Mark I Extravehicular and Lunar Surface Suit, designed and built before the launch of the Soviet Sputnik I and the creation of NASA, early 1955. Tested during 1958-59 for more than 600 hours, but never used for real space missions.